Each year, thousands of motorcyclists suffer severe injuries and lose their lives, in terrible accidents in California. According to the California Office of Traffic Safety, nearly 12,000 California motorcycle riders suffered serious injuries in crashes with other vehicles in 2013. In addition to thousands of injuries--close to 500 motorcyclists died in accidents. When a motorcyclist is involved in a collision, the damages are often catastrophic. This is because the rider is exposed to the full force of the crash whereas someone in a sedan or pickup truck at least has the benefit of airbags and other safety features not available on a typical motorcycle. If you or a loved one suffered an injury while operating a motorcycle, you need to contact an experienced Davis motorcycle accident lawyer to discuss your legal options. It is important to note that the amount you can recover through a motorcycle accident injury claim also depends largely on the available insurance coverage. If the negligent driver who hit you has a bare-bones auto insurance policy, we may need to file a claim through the uninsured/underinsured motorist coverage in your auto insurance policy. the lawyer has actual experience representing clients who were hurt badly in motorcycle accidents. Watch the short YouTube video below for more information on motorcycle accidents and what you will need to do. Not much time. California has a statute of limitations codified in Civ. Proc. §335.1. The statute of limitations states that you have two years from the date of your injury to file a personal injury lawsuit against the negligent party or parties. This means, as a general rule, if you fail to file a lawsuit within two years, your case will likely get thrown out of court. A notable exception to this rule is if the victim was a minor (i.e., under the age of 18). If your teenage son or daughter was injured in a motorcycle accident, the statute of limitations is tolled (i.e., stopped) until they reach the age of 18. Once they turn 18, they have two years from that point to file a lawsuit. 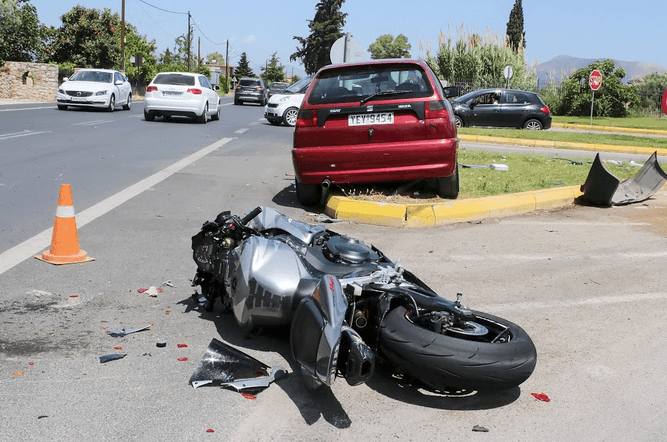 Will My Motorcycle Accident Case Go to Court? Every case is different. Therefore, there is no single, definitive answer to this question. Nevertheless, most personal injury cases do wind up settling without having to present the case to a jury. Keep in mind, as the client, you are empowered to approve or deny any settlement offer made by the insurance company. Your lawyer cannot settle a case without your consent. Once a settlement offer is conveyed, your lawyer will offer their advice and counsel on whether it is a reasonable offer, but the decision to settle will be left to you. What Needs to Be Proven in a Motorcycle Accident Injury Case? Duty – We must establish that the defendant owed a legal duty to you. For example, in the motorcycle accident context, drivers owe a duty of care to other motorists on the road, including motorcyclists. Breach of a Duty - We must prove the defendant breached the above-described legal duty. For example, if a driver was intoxicated or texting on their phone when they collided with your motorcycle, that would constitute a breach. Causation – We must prove that the defendant’s reckless actions, or inaction, proximately caused your injuries. This is a fairly easy element to meet, especially in the context of a motorcycle accident injury case. Economic and Non-economic Harm – We must prove that suffered harm and incurred economic and non-economic damages from the accident. This often includes submitting medical bills and lost wages as evidence. Your lawyer should also develop persuasive evidence to present your pain and suffering damages to the jury. Suffering an injury from a motorcycle accident can be a traumatic and overwhelming experience. You should focus on recovering and getting back to 100 percent. This is why you need to hire an experienced lawyer who will do all they can to secure maximum compensation in your case. I’m Ed Smith, a Davis Motorcycle Accident Attorney. If you or someone you care for has suffered a serious injury in a motorcycle crash because of someone else’s negligence, please call me right away for free, friendly advice. I can be reached at (530) 392-9400 or (800) 404-5400. I have been practicing law in California since 1982. I’ve helped many motorcycle accident clients receive the maximum amount of compensation. This includes the personal injuries they suffered as well as accidents involving wrongful death. You may want to look at our past settlements and verdicts page to learn about the results I’ve obtained. I belong to the Million Dollar Advocates Forum. This is a group of top US injury attorneys. Membership is granted to lawyers with verdicts in excess of $1 Million US Dollars.